You would have played the game called super mario in your life or must have heard about it. It was a very popular game in my childhood days. Even now it's popular online and sometimes, I see my friends playing it online or on older game players. 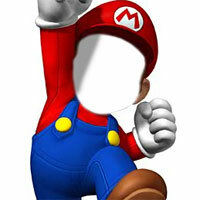 You can see the super mario on this website and add images to the Super mario brothers online effects on the photomica. You can also add the photos with close up to the face of your children to this picture as super mario is really cute. Try adding your boyfriend or girlfriend's photo to this picture and make them cute and funny as well.